My current exhibition at the Fraser Georgetown space comes down tomorrow. F. Lennox (Lenny) Campello, one of the lynchpins of the DC art scene, is having a show in Georgetown at the Fraser Gallery (1054 31st St. NW, Tues. - Fri. Noon - 3pm, Sat. Noon -6pm). Campello renders mythic scenes with mystery. He has complete mastery of his medium and works on a ground that seems to come from deep dreaming. 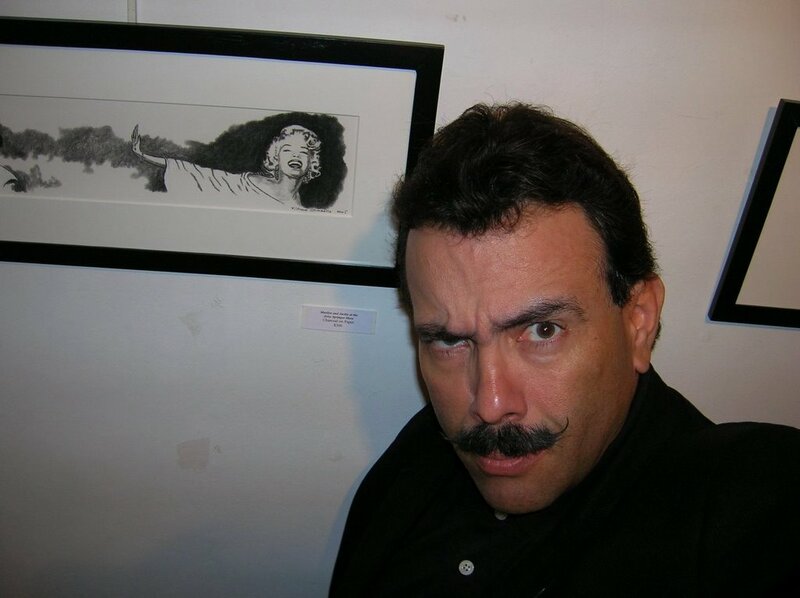 Campello writes on his dcartnews.blogspot.com, the premiere art blog of DC, "For some reason snowy days seem to inspire me to get down and draw. And I was up and early this morning and finished (a) somewhat silly drawing." The drawing, "Woman on the Moon About to be Swept Off Her Feet by a Flying Bald Man," has a relation to Goya's darkness, or duende. Unlike Goya, Campello does not offer a social or political message. Like Goya, he creates enigmatic juxtapositions of figures or figure and space (as in "Another Obsessive Jackie Kennedy Portrait"), hinting at something disquieting. Campello states "Myth is one of the driving forces in my work! I love it when someone discovers a bit of legend, or history or religion through one of my works." Being a gladiator at heart, Lenny takes on some of the major myths from Marilyn to John the Baptist to Frida Kahlo to Saint Sebastian. He is fearless. His Frida Kahlo is an homage to the Mexican artist and icon. The work presents a calm Kahlo, but in its off-placement on the page there is something that makes it not quite rest-in-peace. It is Campello's uneasy atmosphere of dream that is as much the subject of the work as the stormy Kahlo herself. Campello has been drawing Kahlo since 1977. He has also done hundreds of portraits of Marilyn and Che. In his "Saint Sebastian" it is the flight of the arrows that is as much the drama as the piercing of the flesh of the poor saint. The enclosure and evocation of the space in the drawing is again the subject as much as the arrow's fight and their unfortunate trajectory. Adrian Parsons has a new arts blog: In the City for Art and a Job. And already Adrian has gone dumpster-diving and come up with some good art! DC artist Christopher Goodwin is auctioning off a very unplesant memory/art on Ebay. Bailey is having fits (funny fits anyway) over Blake's plan for the Smithsonian, while Kirkland and his readers are discussing Gopnik's use of new adjectives to describe the status of artists.